The biggest Rythu Bazaar in Vijayawada is going to shift from the sprawling PWD Grounds (Swaraj Maidan) to near Alankar Theater. 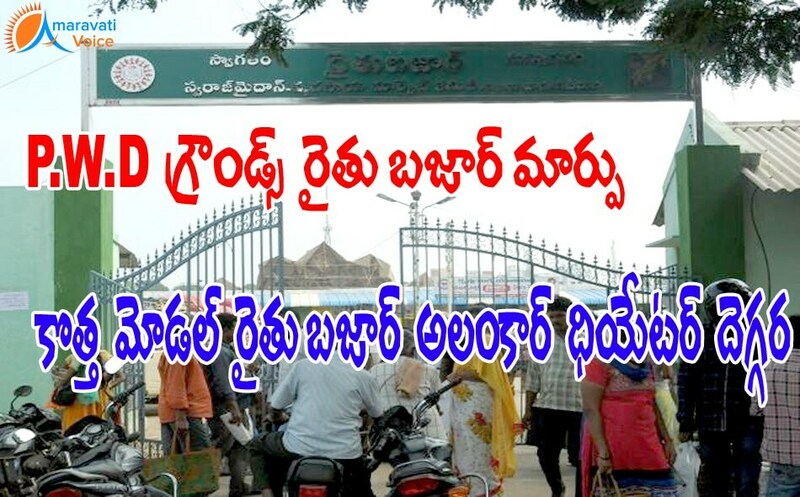 As the current PWD grounds is going to be "City Square", Rythu Bazaar is being shifted. A brand new Model Rythu Bazaar with good infrastructure is going to come up here, with a cost of Rs.4 crores. Approximately 350 shops would be built here, with good infrastructure. The present Rythu Bazaar in PWD Ground is constructed in 1999, in 1.34 acres. Then TDP government, with an aim to supply vegetables at a lower cost, has constructed this. There are 325 shops in the Rythu Bazaar and approximately 15000 customers will come to the market everyday and purchase commodities.